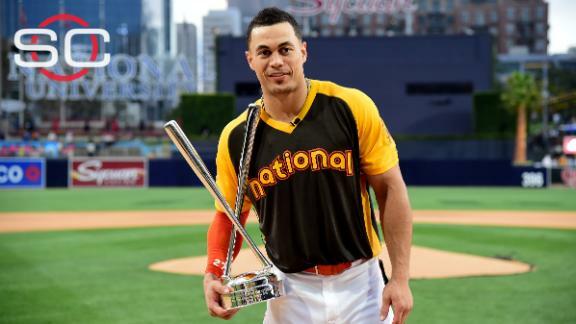 SAN DIEGO --Giancarlo Stanton wore out Petco Park with a record display of power in the All-Star Home Run Derby on Monday night, peppering every landmark from the left-field corner to center field. Stanton hit 20 homers in the final round to best defending champion Todd Frazier of the Chicago White Sox. Overall, the Miami Marlins slugger hit a record 61 homers, shattering the single-night mark of 41 by Bobby Abreu in 2005. Stanton's impressive shots hit the top level of the Western Metal Supply Co. building in the left-field corner and the top of the batter's eye in center field. He sent several balls just below the giant scoreboard high atop the left-field stands and several over the bullpens in left-center. "For sure, being on the West Coast and taking the flight out here just for this, you know. I figure it's a waste if I don't bring this bad boy home,'' Stanton said, hoisting the trophy. The three-time All-Star is not on the National League roster for Tuesday night's game after batting .233 with 20 homers and 50 RBIs before the break. "That is where I got my childhood memories, watching the Home Run Derby as a kid,'' said Stanton, who's from Los Angeles. Frazier, who's not on the American League All-Star team, hit 13 in the final round. He was a hometown winner last year while with the Cincinnati Reds. He was traded to the White Sox in December. The Western Metal Supply Co. building served as one of the better Derby targets, joining the Warehouse at Baltimore's Camden Yards in 1993 and McCovey Cove outside San Francisco's AT&T Park in 2007, which were all targets for lefty hitters. Stanton hit 24 homers in the first round to eliminate the Seattle Mariners' Robinson Cano (seven) and 17 in the semifinals to knock out Mark Trumbo (14) of the Baltimore Orioles. Frazier hit 13 in the first round to beat Carlos Gonzalez (12) of the Colorado Rockies, and 16 in the semifinals to eliminate Adam Duvall (15) of the Reds. Trumbo, who leads the majors with 28 homers, had two of the most impressive shots of the night, off the scoreboard in left field and onto the top of the Western Metal Supply Co. Building in his semifinal matchup against Stanton. Wil Myers of the San Diego Padres tried to become the second hometown player to win the Derby. With younger brother Beau -- an infielder-outfielder at Appalachian State -- pitching to him, Myers hit 10 homers in the first round and was eliminated by Duvall with 11. Beau Myers hit his brother with a pitch early in the four-minute period, and nearly nicked him another time. Giancarlo Stanton hits a record 61 long balls to capture the Home Run Derby crown, including 20 in the final round against Todd Frazier.